A while back I promised to make this video series and it’s finally here! 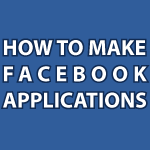 In this video series you will learn How to Make Facebook apps. I’ll cover every subject imaginable. If you want to see this first app look for the tab named Top Video in my left sidebar on my Facebook page. I made this app because someone was actually charging to allow people to post their YouTube videos. It was fun to make and useful. All of the code for this video and the next video is available below. You can do whatever you want with it. If you have any ideas you’d like covered leave a comment below. I’ll do my best to cover everything. can i ask?can i use php in making a facebook application. in our thesis were making a facebook application so can you please tell me what will be the easiest language that i can use in making a facebook app. thank you please reply in my email. Yes you can definitely make Facebook apps using PHP. It is a web page just like any other. The only difference is that it is displayed in the Facebook interface. I am having difficulties trying to make an app on face book for my friends and I. I wanted to make an app which allows my friends and I to share links with each other so we can help each other out on a game. It is sort of a link exchange where we can post a link and have others lick on the link in order to help each other out on the game. Can you help me with this? Add link button. I want to be able to post the name of the person, location, description, Posted (UTC)time of post, time left, and how many clicks on link. If there is any way to help me please let me know.. oh and a refresh button link and add as a friend link. You need to create all of these tools using a language like PHP. Do you know PHP? Thanks for your response, I appreciate your time. Can you make an application for Facebook for me???? I’m going to add on to this tutorial after Facebook makes their recent changes permanent. Hello thanks for the great tutorial. But i can’t find my app? Your java is really nice and i want to make a lot of cool thinks..
You should be able to search for the app in facebook? I looked for it, but it doesn’t show up. Is your app name BigAirBag-Hot-Videos? Can fbml still be used. Alot has changed, is it possible that you could have an update on how to do this with iframes. Also would like to add that I love your site, informative and interesting. A bookmark for me. As much as I’d like to think myself capable of recreating this app for my company FB page, I know my limitations. Do you have time and interest in creating this (or other) app(s) for others? Hi, While I don’t accept work I will do my best to walk you through the process of making a FB page. What do you want it to do? I have generated ssl certificate, any advice on what to do next ? will it work now? Hello, Would you have an email or could create one for public people to contact you? I have many questions that I would look stupid typing in a comment box with hahaha. Trying to setup a app such as this one but cant find any tutorial.. Maybe you could help. What this app does is that it takes the name of the user, match randomly with a picture in the server and publishes the final result in the wall for all the friends to see and also know the user is using such app. hello, i have a question, regarding to facebook app. whenever someone tag me on any pic or that pic needs to be filter i mean, if the pic is invalid(something illegal, or any naked pic), that person cannot tag me on that pic. is it possible to filter images..? I’m not sure about that. That sounds like something that would be controlled by Facebook. You could adjust your privacy settings to be alerted anytime someone tags you in a photo though. I am the Online Social Media Manager for a small company. I have not dealt a ton with code so I would consider myself a novice in it. I know things that are needed for the social media (i.e. Facebook) and one of those things is apps to have more control. I don’t mind making them myself… and my job allows for me to learn since my work is somewhat of an experiment. However, I do not have access to a website to build the app or store app information. I also don’t have control over finances for the purchasing of such a space. You are required to have a hosting plan and domain name. Both are very cheap. I use a Linux Deluxe plan with Go Daddy. If you don’t want to learn all of these languages your best bet would probably be to post videos on YouTube. It is 100% free and I’ve never seen any social network drive more traffic than YouTube. I’m ranked in the top 99.9% of sites online for generating traffic. Over 73% of that traffic comes from YouTube. People also love to watch videos about a business. They’d love to meet the people and know that they know what they are doing. I don’t think there is a better way to showcase products and services. And, the best part is that YouTube is the least used social network for building brand loyalty. Great work and great advise. I look forward to watching more of your videos. From reading the string of comments, it seems like Facebook has made changes that will require the code you included to be modified. Will the code above still work? I’m sorry to say that it is not working now, All I see is an HTTPS warning. If you’re interested I have sent you a tutorial proposal at your derekbanas@verizon.net email. This tutorial idea could not only address the SSL issue, but also garner you a lot of interest from the GameMaker community. Just check your inbox for something from St. John or stjohn3d. That’s odd, but it is pretty much expected when developing anything for Facebook. Thanks for the input. no-ip.org………….or from the local host?………or if you have any other alternative for that? I am quite looking forward to the continuation in this series of tutorials. I am having the hardest time wrapping my head around the social plugins and the facebook sdk to have the dynamic interactions on my app. hey i don’t have any website, what do i give in the canvasURL? and can you make wordpress facebook apps which can display recent post from the wordpress blog ? please email me if you can. Hello and thank you! I’m going to use this to make a game and post it. If you would like to give more of yourself and make another awesome tutorial… :0)… How to connect/listen for connection on your FB app would be awesome! I’m thinking a card game. Either way, thanks for a great start! plz tell me How to make a Facebook Game App you have any ideas ? I have a website but I have not purchased a SSL certificate yet. Are SSL certificates (https) now absolutely necessary to create FB apps? Hi, i want to make app like stick run but not same. Any help? Instead of youtube video I want to put photo with same options (that people could like it and comment it) in application … which part of the code would change and how? You’re very welcome 🙂 This is kind of a complex task because you are going to have to deal with the oauth login process. Have you tried pulling data from pages using my Android tutorial on parsing xml and json yet? I would like some kind of app that will create more traffic,maybe FB ‘friends’ or Likes. Is der any oda fbk app code apart 4m dis? Do you want to make a Android facebook app?